Picking the Best Toilet Repair Kit - Fix Leaks & Cracks & Anything Else! / Picking the Best Toilet Repair Kit – Fix Leaks & Cracks & Anything Else! Picking the Best Toilet Repair Kit – Fix Leaks & Cracks & Anything Else! Last Updated April 21st 2019: We might not like it but unfortunately toilets will always break at some point. It’s a fact of life, as certain as traffic when you’re late or rain when you forget the umbrella. In fact it’s most likely to happen when it’s most inconvenient. If you have guests over and your toilet starts playing up you need to be prepared to jump into action and get into plumber mode. That being said, if you have the best toilet repair kit possible, then repairs are a piece of cake! If you are experiencing clogs then I would suggest getting a toilet auger. Now you can call an actual plumber of course, but unfortunately they’re pretty expensive and those bills will add up. If you’re still within warranty then that’ll cover it, but for those of us who aren’t we can’t shell out every time something stops working. A more cost effective alternative is to get your hands on a cheap toilet repair kit. 1 Picking the Best Toilet Repair Kit For Easy Repairs! Picking the Best Toilet Repair Kit For Easy Repairs! Most of the time repairs on your toilet are pretty basic and you’ll only need a few items to get it working good as new again. Toilet repair kits have all the basics to get the toilet working once more within a few minutes. So stop paying through the nose for a plumber and check out these great toilet repair kits we’ve found. If you are in need of only an toilet flange or a toilet flapper then check out our individual reviews. Fluidmaster have put together a very complete kit with all the products you might need to get things flowing again. It might look a little intimidating at first for anyone who hasn’t seen the products before, but don’t be put off It’s actually all pretty simple when you get down to it. This all in one toilet repair kit features everything you need to deal with the common issues of a noisy toilet, running or leaking toilet, slow filling toilet and toilet with weak flush. All of these issues are frustrating but aren’t worth calling a professional over, now you’re able to take it into your own hands. The Fluidmaster toilet repair kit is much more advanced than a lot of the competitors. It has a number of replacement parts than help solve non emergency issues in your bathroom. There aren’t many quick fix problems it isn’t equipped for. If you are looking for an individual toilet fill valve then checkout our reviews! The Fluidmaster toilet repair kit comes with full instructions for each part. This walks you through exactly the processes you need to go through for it to function well again. The kit features products which are innovative. The solid frame of the flapper helps eliminate any twisting or ghost flushing plus all the pieces are chlorine and hard water resistant. This product is one of the most useful around for maintaining a troublesome toilet and one to keep in the home even if you haven’t had any problems yet. Please bear in mind that this will only function on toilets with 2 inch flush valves. Danco have created a more simple toilet repair kit that is just as able to cope with the problems. Each item within it has been specially selected and modified so it can be used by anyone with ease. Danco produce a wide variety of bathroom items and their expertise is known in the field. Within the Danco toilet repair kit you’ll find everything you’d expect. 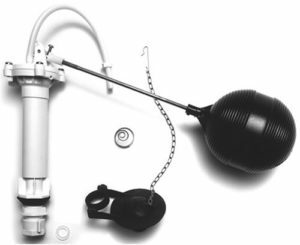 This includes a spring, a flapper with adapter, a float with rod, and a ballcock with floating tube. This is everything you need to get your toilet working again quickly. Danco have chosen a design that will fit almost any toilet. The items will hold up even in high use areas and are sturdy enough that they won’t need to be replaced immediately. This is a great kit to keep at home in case anything goes wrong. The Danco toilet repair kit comes with detailed instructions on how to use each element. It’s fairly simple to use and a lot of novices seem comfortable using it if occasion calls for it. Each piece within the Danco toilet repair kit has been put there for a reason. They’re all durable and reliable plus they can be used on practically any toilet. You can rely on this toilet repair kit. The Danco repair kit is really competitively priced to keep in the home. It’s saving people money on plumber call outs and replacement parts and over the long run it’s a great investment to have. The Danco toilet repair kit contains a lot of items which will get your toilet back on it’s feet quickly. It’s one of the simpler toilet repair kits that understands most users will have absolutely no experience in the field. For some great value the Danco toilet repair kit offers a lot. The Korky toilet repair kit is suitable for use on any toilets with a 2 inch flush valves, but that is the most common variety. This is definitely the most basic pack of the three with only the bare essentials needed to get the toilet functional once again. This toilet repair kit is smaller and only contains a Korky Plus flapper, a plastic flush valve seat and silicone sealant. If all you need is an individual toilet seal, then you can buy these separately. All of these items are used when you have an issue with corrosion on your brass valve seats. This toilet repair kit is less of a general repair kit but is instead designed to deal with one specific problem of corrosion. Each of the items are made with engineered materials that makes them resistant to chlorine, hard water and bacteria. These are all elements which are common in toilets so this resistance helps improve the effectiveness of the toilet repair kit. 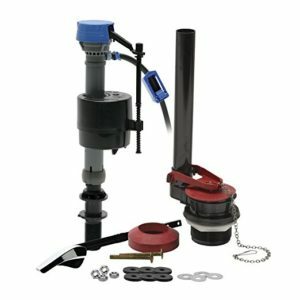 This specific toilet repair kit allows you to remove and replace a corroded flush valve simply and without removing the whole tank. This makes it an infinitely easier task for yourself. This toilet repair kit lets you tackle the problems you’ve been putting off before. If you have a flush issue then the content of this kit will be able to help you solve it quickly and efficiently. The Korky toilet repair kit isn’t as comprehensive as the other two but is nonetheless a good product to have in the home. You’ll be able to use the instructions provided to put a temporary mend on your toilet with no hassle. You will encounter toilet issues at least a couple of times in the home and it’s always better to be prepared for when it happens. That being said, if you are faced with a stinky smell, then checkout our bathroom smells air freshener. A toilet repair kit doesn’t take up much room but when fate strikes if you have it handy you’ll save lot of time and money. Each of these three toilet repair kits is useful for protecting your home. 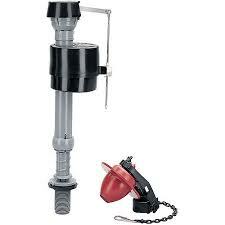 The Fluidmaster toilet repair kit is probably the most advanced but it is also the most expensive. For a more budget alternative then check out the Danco repair kit. If you are someone with sensitive skin, then check out our guide for the best toilet paper for those with sensitive skin!